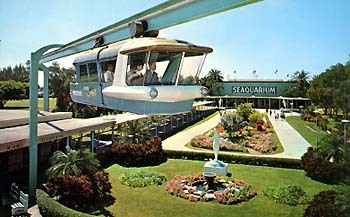 Constructed in 1963, the monorail at this famous sea-life park was billed as the first of its kind on the East Coast. 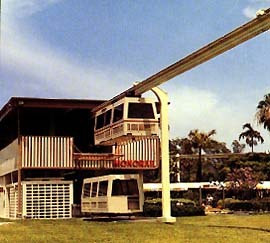 Suspended on the 2385 foot long guideway, the five cars (with one in reserve) carried guests on a six mph trip past show and exhibit buildings until its demise in 1991, when track demolition was started to make way for a park expansion that did not include the monorail. The original cars were named for fish and had operating headlights and air conditioning. In 1978, the cars were re-skinned with boxier, less unique bodies. Anti-collision systems were automatic with block zones, controlled by an operator at the central console. 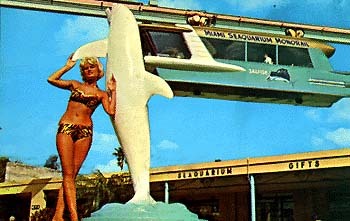 General Manager Jose Hoyo reports that the monorail was taken out of service for several reasons, namely because it was labor-intensive to operate, it had become obsolete, and because of the park's growth it had become difficult to view the dramatic vistas, especially the skyline of Miami across the bay. Hoyo says that if the monorail had only run clockwise, several sitelines would have been improved, and possibly might have saved the system. It is enigmatic to note that one of the chief reasons that the system now sits as rusting, half-demolished guideway is that the monorail was low in ridership because it had LOST ITS NOVELTY AS A RIDE! After talk of using the system as transportation from a remote parking facility died down, park expansion plans dropped the monorail and all six cars remain backstage, doing ignoble duty as storage sheds. But there is hope for these trusty carriages; the Palm Beach & Lake Worth Scenic Railway Museum is trying to purchase them to restore as an important segment of railroad history.